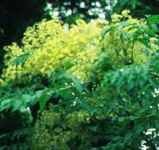 A deciduous tree with narrow pointed leaves and yellow blooms. Young shoots are cooked and eaten and the roots are used to treat arthritis. Hardy to -30F (-34.4C); height: 15ft.